At first glance, the European Youth Parliament may sound like many other NGOs. It is described as a “platform for discussion of current social, economic, and political issues, as well as cultural exchange,” that aims at “fostering active citizenship among young Europeans.” Being an organization that helps develop the opinions of many young Europeans, the European Youth Parliament continues to shape FLEX alumni with every event they attend, providing them with opportunities to develop and to explore the world around them. Today, we want to focus on three alumni from Ukraine whose contribution to the European Youth Parliament over the course of the past few years has been immense. 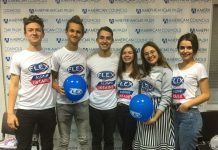 The EYP in Ukraine was founded and developed by two senior FLEX alumni, Olga Smyrnova ’97 (Kyiv, Ukraine/ Oblong, IL) and Vasyl Myroshnychenko ’97 (Khmelnytskyy, Ukraine/ Chattanooga, TN). Today, the younger generations take over and help to shape the history of the organization. 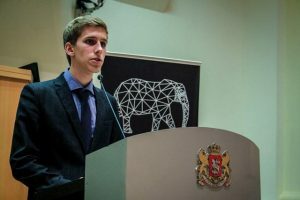 Pavlo Odnonozdryev ’17 (Kyiv, Ukraine/ Wymore, NE) has been a member of EYP for three years and during his EYP career, Pavlo represented Ukraine internationally at the Fifth International Forum of EYP Georgia and the 82nd International Session of EYP France in which he took part in debates over the pressing issues regarding social and policy matters within the European Union and beyond. Pavlo has also had the opportunity to get a glimpse into the work of media teams at EYP at multiple sessions. Having gained experience on the media side of the EYP as a Journalist at the Kuopio Regional Session of EYP Finland, Pavlo was chosen to be a Video Editor of the 11th National Selection Conference of EYP Ukraine. After coordinating several video projects at the aforementioned sessions and producing content himself, Pavlo went on to become an Editor (and head of the Media Team) at the Seventh Southern Regional Session of EYP Sweden, where he led an international team comprised of four people. Right now, Pavlo is currently working on two more projects within the European Youth Parliament: he has been chosen to be an Editor of the Trier Regional Session of EYP Germany and was invited as an Editor of the International Forum on Human Rights in Strasbourg, Paris. Another active member of the organization is Mariam Kunchuliya ’11 (Kyiv, Ukraine/ Yachats, OR), who over the past three years has attended more than 30 events. Mariam represented the Ukrainian National Committee at the Board of National Committees meetings in Berlin, organized a session in her hometown of Zaporizhzhia and a training camp in the Carpathians, and has been chosen to be a Chairperson at multiple events of various levels, from regional EYP events to International Sessions. Mariam has been able to put her knowledge and experience into action and became a Board Member on Public Relations, contributing to the development of a positive image of EYP Ukraine. Her immeasurable contributions and active participation within the organization resulted in her being invited as a President of sessions in Poland, Slovenia, and Switzerland, respectively. Alumna Lesya Pohorila ’15 (Kyiv, Ukraine/ Seabrook, TX) is a Board Member on Human Resources for EYP Ukraine. She first joined the organization in 2016 and has since been actively participating in numerous events both in Ukraine and abroad. She has been a chairperson at sessions in Ukraine, Poland, Slovenia, and Armenia, which provided her with valuable experience to become a Vice President at the events in Bosnia and Herzegovina as well as Slovenia. Typical European Youth Parliament closing-speeches include the adage: “European Youth Parliament may not seem to change the world, but it changes you.” It conveys what being a member of this organization means for its members, including the participating FLEX alumni. What they experience today will continue to ceaselessly shape them in the future. 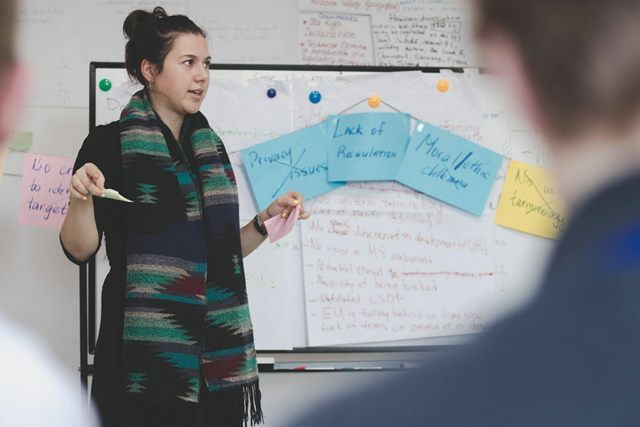 As members of European Youth Parliament, they will possess an acute awareness of the world they inhabit which will inspire each of them to find a way to positively impact it, even if just a little bit.